Look carefully at the picture above. Notice something odd? However, both pictures are from my garden, though I must admit that the first dahlia was only planted this evening, so the slugs probably don’t yet know it’s there. 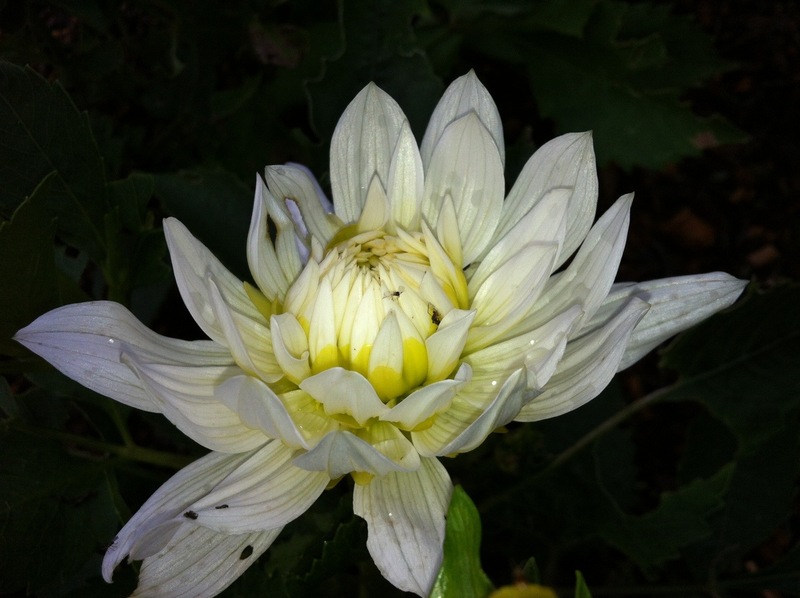 Clearly the second picture shows a dahlia that the slugs know far too well. But… Some time ago, the Flâneur Husband read somewhere that dead moss could work as a physical slugs barrier. It won’t harm the slugs, but supposedly they don’t like crawling over the dead moss. It makes sense, really, as they don’t like coarse sand, sawdust and other coarse surfaces, so it might work. To give it a go I had to get up on a stepladder and use a lawn rake to try to get enough dead moss off the roof of the annex, and as you see in the first picture I’ve spread it thickly around the newly planted dahlia in a barrier 6″ wide. I’m curious to see if it will work, but my fingers remain crossed for now (making it rather difficult to blog…). Anyway, this entry won’t be all about the slugs. 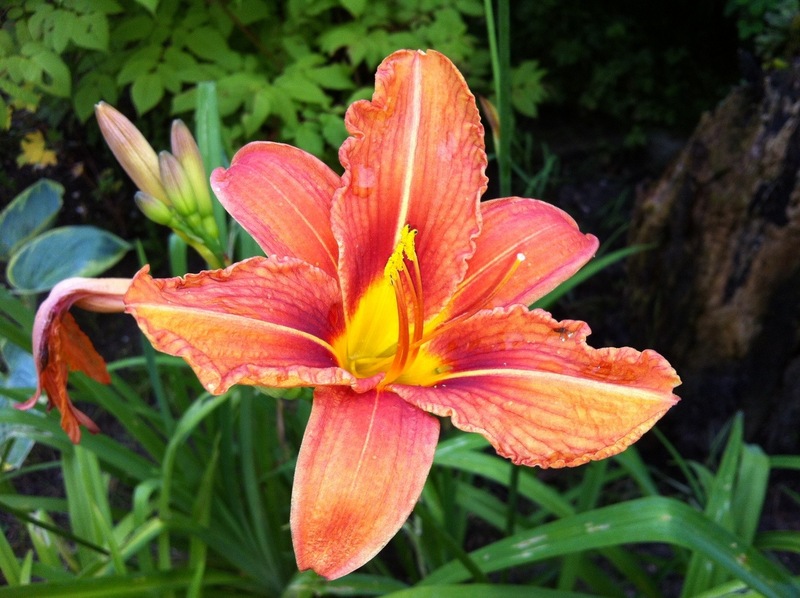 Look; the first daylilies are blooming! 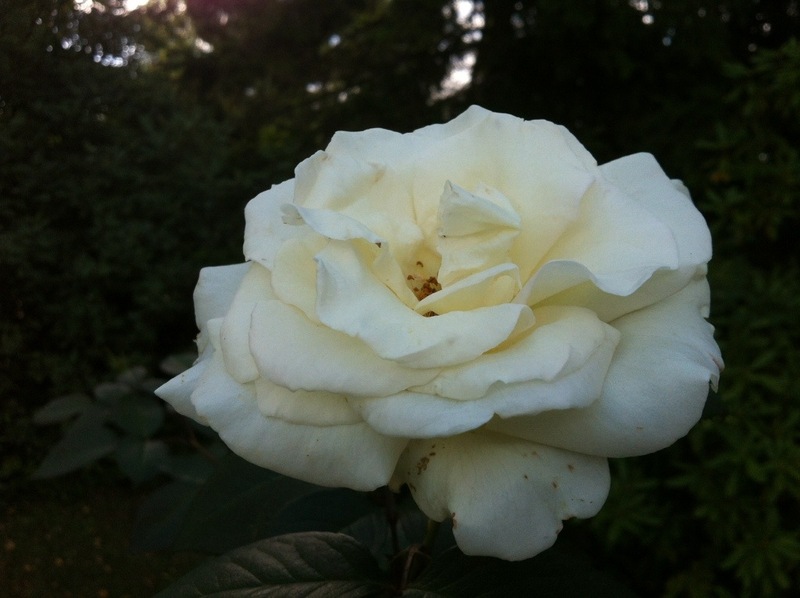 Yesterday there were no flowers, but today there are two – with many more to come. 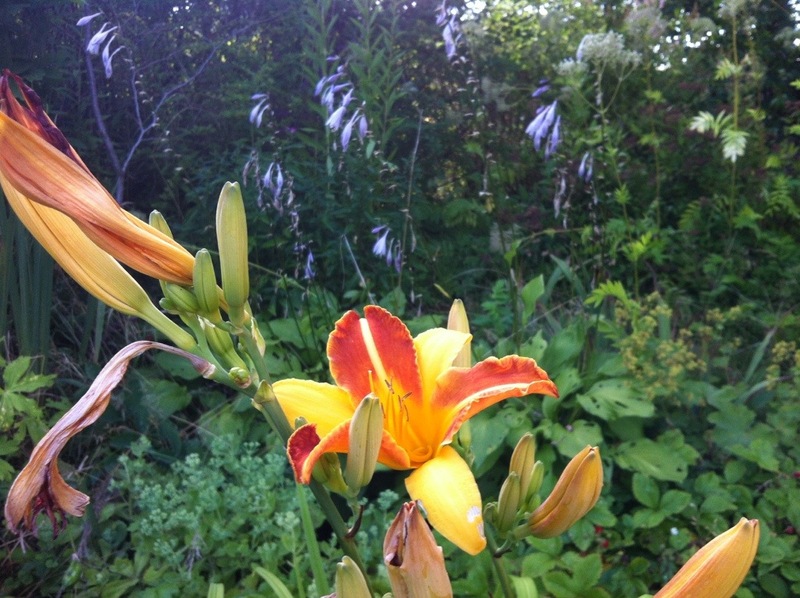 This is an unknown variety from the Flâneur Husband’s grandmother’s garden (perhaps hemerocallis fulva? 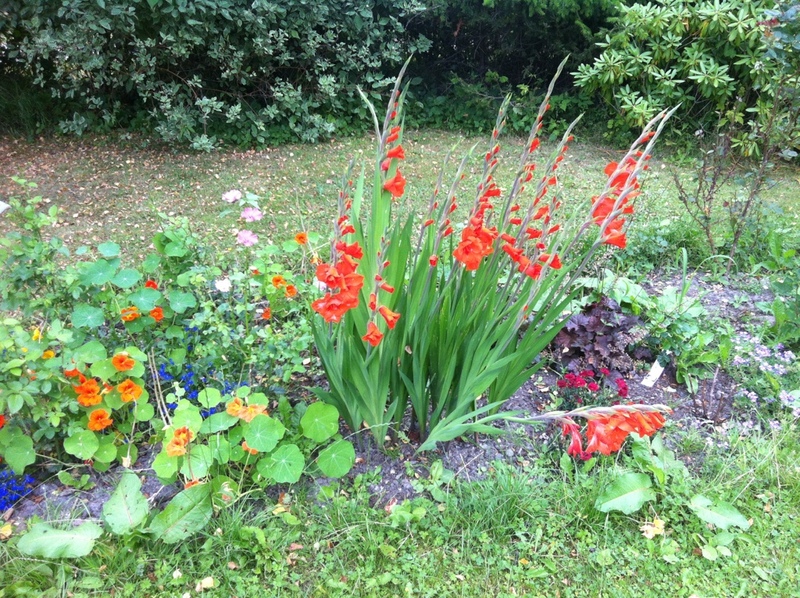 ), and it happens to look just like the daylilies my own mother and grandmother had in their gardens; it’s been around in Danish gardens since around 1900 and it’s as reliable as it gets. 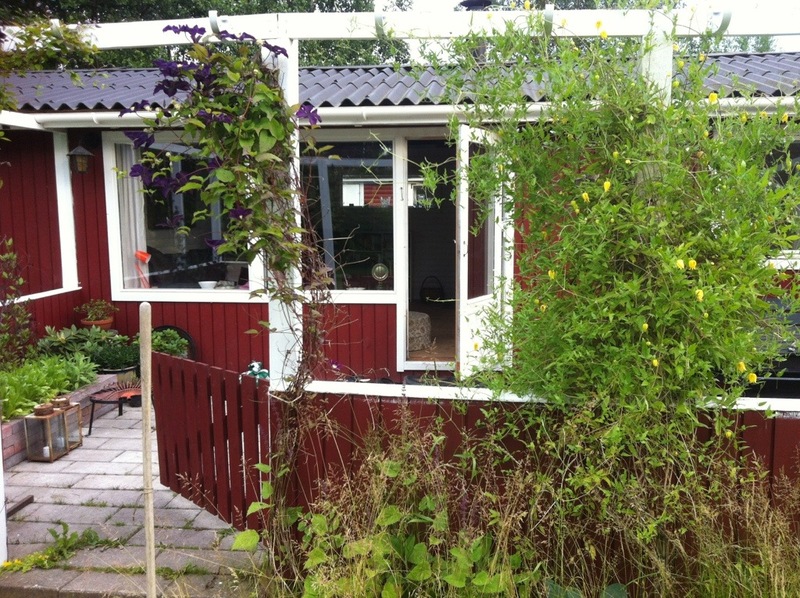 It spreads a little – enough to ensure that people could give their neighbours surplus plants, probably accounting for it’s wide use – but it’s manageable and perfectly adaptable to any weather the Danish climate can throw at it. 35 Celsius summer day? Fine. -20 Celsius winter nights? Fine. Rain? Fine. Drought? Fine. It’s a tough plant, and I love it for it. 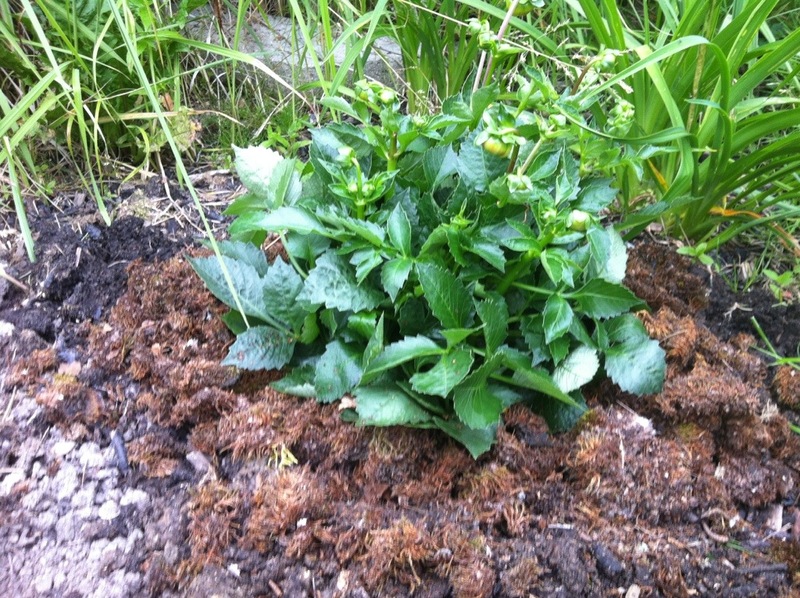 A plant that doesn’t need “the benefit of the doubt” is the deadnettle in the Evening Border. 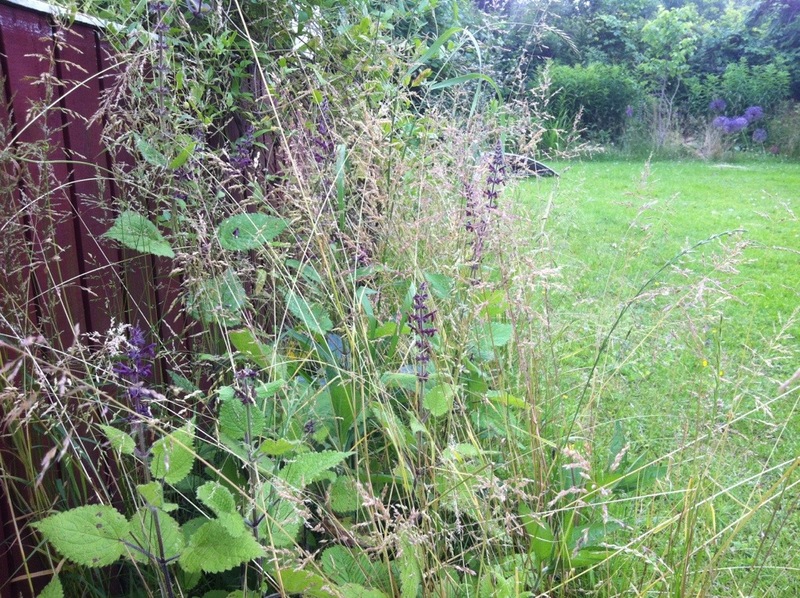 This year I haven’t really gotten around to weeding it – does it show? – and that means that there are some rather attractive long grasses growing there and a vast number of deadnettles. I quite like it, though it wasn’t the look I originally aimed for with this narrow border up against the Uncovered Terrace. Still, sometimes wild flowers should be allowed to do their thing if they actually look as good as anything you could create yourself, and in between them are numerous rudbeckias and 3 hostas (as well as four clematis to climb the posts of the terrace), so it has become a mix of wildflowers and cultivated plants. I’m not quite decided about it yet, but I quite like the wildness of it, and the cultivated plants in the border are fortunately tough cookies that won’t mind the competition. It takes a lot to knock out a rudbeckia or a hosta, right? And the clematis prefers some undergrowth anyway, so it seems a good idea to wait and see what happens, rather than attack the border with a belated weeding frenzy. 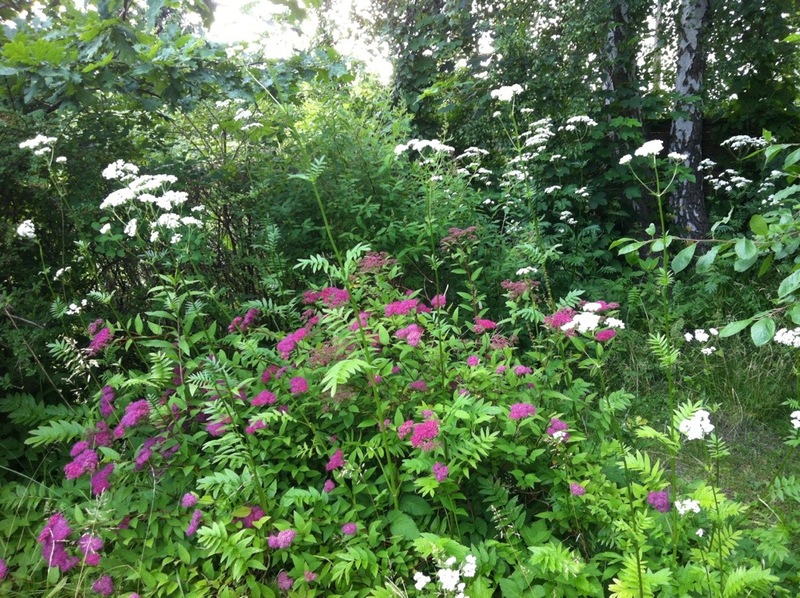 Another “wilderness” in the garden is between The Puddles and The Hedgerow towards the road; there’s a spirea japonica growing amidst a tall weed with flowers that somehow echo the flowers of the spirea. I quite like the combination, and it makes me happier about the spirea that I didn’t really like at first. I’m not sure what the weed is – or whether it might actually NOT be a weed but something a previous owner planted on purpose – but it grows to 6-6′ and dies completely away in winter. It might be a perennial, it might be an annual, but either way it spreads like crazy, so even though I like the foliage and the flowers I regularly have to pull out volunteers in areas where they don’t belong – and where they will inevitably flop over before blooming. They are spreading around The Puddles, which is all right since there they are supported by the iris, the lady’s mantle, the hostas, the astrantias and the daylilies, but in other parts of the garden there’s just not anything sturdy enough for them to stay upright, and that quickly gets to look messy. And that will be all for this jumble of an entry tonight. 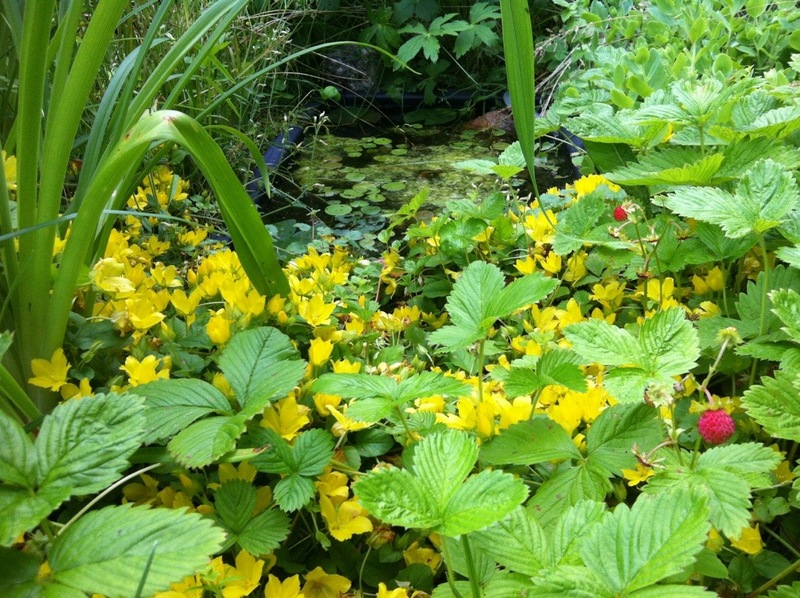 If any of you have a name for the yellow-flowered weed – or the tall white-flowered weed – let me know. Eternal gratitude (or at least as long as I remember it, which might not be very long) will be your reward! Well, in that case I guess I had better throw in something about plants as a counterpoint to my latest entries that seem to have been more about animals than flowers. 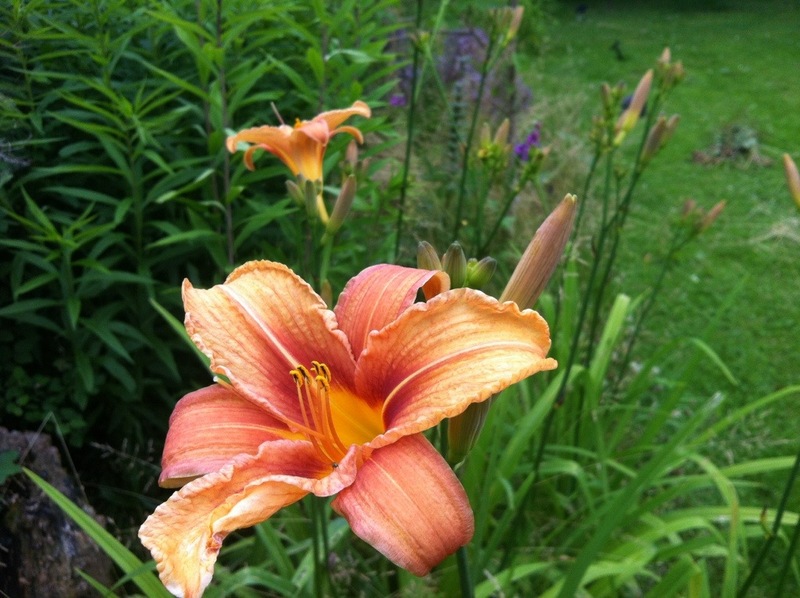 This day lily is a classic in Danish gardens. (I think it’s a hemerocallis fulva, but I might be mistaken.) This particular day lily comes from The Flâneur Husband’s grandmother’s garden, but it was also in my mother’s garden, in my grandmother’s garden and in my great-grandmother’s garden. In other words, this is a classic country garden perennial, though these days it seems to have fallen from grace and is largely out-done by newer, more showy day lilies. Any way, it’s one of those plants that I am not 100% in love with, but it wouldn’t be a proper garden without it, so it has been given a prominent position in The Ambitious Border! And it is pretty much the sort of plant you put in the ground and then never worry about again; it’s hardy as you like, and it spreads very moderately, so it will fill out nicely but won’t overrun its neighbours. Oh, and it blooms at the perfect time for a holiday home garden; in mid summer when we will be spending the most time up here! I do want some of the modern, more showy day lilies, though… Real lilies are so-so when it comes to hardiness around here, and since I already have heaps of dahlias that need to be lifted every autumn and over-wintered in a frost-free place, I think a fully hardy alternative to lilies is a wonderful thing! 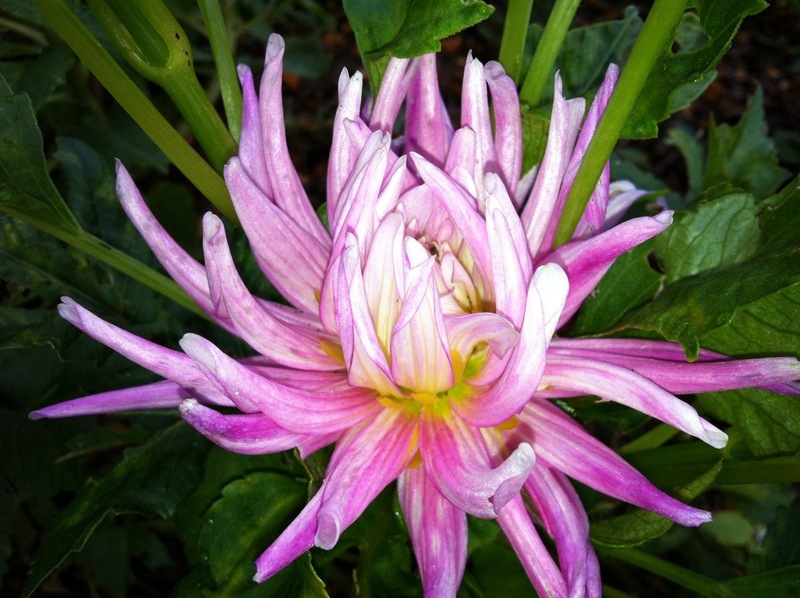 Another wonderful thing is happening in the Sunny Border; my dahlias have started blooming! A few are from tubers that I’ve bought, but most of them I grew from seed in the windows back in the apartment in Copenhagen. It’s still early days for the Sunny Border; there are just a handful of dahlia blooms, but there are plenty more buds waiting to burst, so I definitely think it’s safe to say that growing dahlias from seed has been a success! And it really was dead-easy; I had a germination rate of close to 100%, and all the seedlings survived being transplanted into the bed. 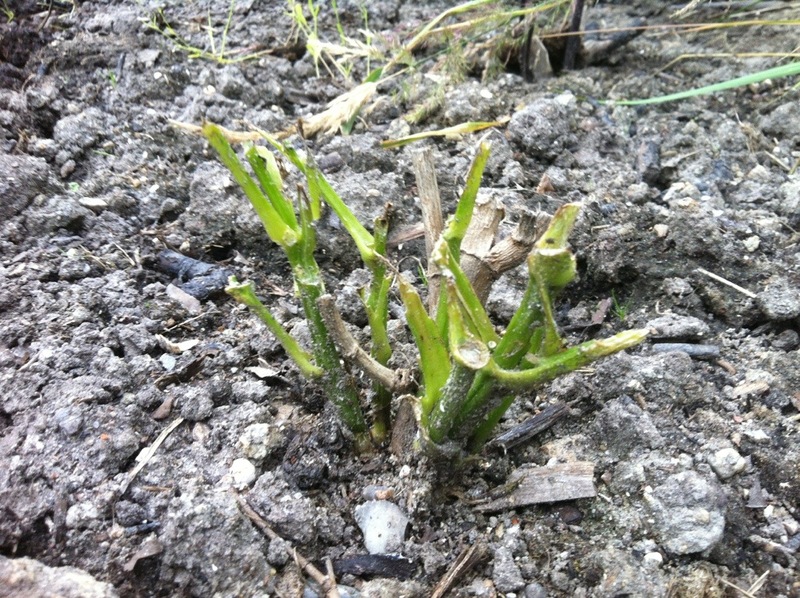 (Some have been more mangled by slugs, winds and rain than others, but that’s hardly the plants’ fault.) Even if one just grew them as an annual and didn’t worry about lifting the tubers in autumn, this is still a great set of plants for very little money. Also, I grew them! From seed! To use the terminology of today’s youth: This is AWESOME! I really post too many close-ups. I’m sure you all know what a dahlia or a day lily looks like, whereas you might not have any way of knowing what The Ambitious Border or the Sunny Border looks like. I shall do my best to get some larger shots soon so you can see what the overall look of the garden is.